Feb. 16, 2018 KamloopsBCNow: Kamloops Sunrays shine at Regional & Provincial Championships! Athletes Haul home 5 gold, 3 silver and 1 bronze at first COMPETITION of the season. Katrina Hohensee of Kamloops was among the nine athletes named to B.C.’s synchronized-swimming team for the Canada Winter Games, which run from Feb. 13 to March 1 in Prince George. The selection process started in August 2013. Swimmers went through a series of trials throughout the 2013-2014 season and competed together in July at the US Open competition. Kessa Kwiatkowski and Meghan Allan are practically siamese dolphins. Last year, they barely knew each other. 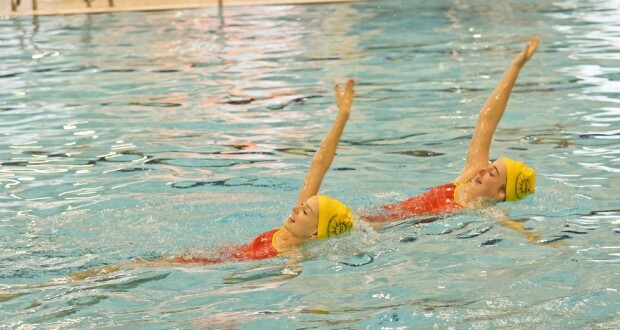 The Kamloops Sunrays’ pair will compete for national gold in the 12-and-under duets category at the Canadian Synchronized Swimming Espoir Championships, which run from Wednesday, June 4, to Sunday, June 8, at the Canada Games Aquatic Centre. “It was their first year last year, so they moved up a level together and became partners,” said 19-year-old Carly Helgason, who coaches the pairing. The duo, both swimmers are 12, formed in September and has been working on the same routine since then, perfecting each movement, mastering each maneuver. “They bring out the best sides of each other,” Helgason said. Kessa attends McGowan Park elementary and Meghan is a student at Dallas elementary. It was swimming, not school, which brought them together. The biggest moment of their young swimming careers will take place on Friday, June 6, when their division takes the water starting at about 3:30 p.m.
Each provincial team gets one shot — only one opportunity — to nail their routine and claim national gold. “I get nervous and excited at the same time because I know that I have one chance, so we have to make sure we do it well and to the best of our abilities,” Kessa said. The music — a Russian dance number — long ago began to get on the nerves of Helgason but, without the repetition, the team would be dead in the water. Meghan, unlike her coach, is not yet sick of the song. “I kind of like it,” she said. “It gets fast at the end. You use the music. You memorize the skill you’re doing to the music. The going gets tough for the swimmers near the end of the routine, when fatigue can often lead to mistakes. “I have trouble holding my breath for a long time and my legs get tired,” Kessa said. For the coaches, the stress begins to build when their pupils hop in the water. “As soon as they walk in, I can’t communicate with them,” Helgason said. What are the Espoir nationals? The Espoir nationals feature the country’s best synchro swimmers in the 12-and-under and 13- to 15-year-old divisions, along with athletes with disabilities. On the line are spots on the 13- to 15-year-old Synchro Canada team which will compete internationally. The event — which is expected to attract more than 275 swimmers — will be broadcasted live at synchro.ca. By: Kamloops This Week in Sports, Swimming February 18, 2014. The Kamloops Sunrays’ junior synchronized swimming team placed third on the weekend at the provincial championships in Surrey. Katrina Hohensee, Clarissa Nauss, Emily Crowe, Katie Ignace, Cameron Blades and Sarah Klassen earned a spot at a national qualifier meet in Montreal in March. Katie Hohensee and Naomi Woolverton represented the Kamloops Sunrays Synchronized Swim Club on the weekend at the provincial championships in Surrey. Hohensee placed first in solo competition and sixth in figures, with Woolverton earning third in solo and 11th in figures. The duet placed first in their duet and first in Championship, improving their scores by several points from regional championships. The next meet for the FINA junior national swimmers is in Calgary, where they will attempt to qualify for the national championships, held in Quebec City. The Kamloops Sunrays, from left, Carly Helgason, Katie Hohensee, Skye Griffith and Naomi Woolverton, attended the Canadian Open Synchronized Swimming Championships, which wrapped up on Sunday, May 6, in Victoria. Helgason, competing in her last meet as a Sunray, placed 24th in the junior solo division and 26th in the junior duet division with teammate Woolverton, who placed 31st in the solo division. In the 16- to 18-year-old division, Hohensee and Griffith placed 18th and 22nd overall, respectively, in solo competition. The duo placed 15th in duet swimming. In Synch with the music, again and again . . . When the average person gets a song stuck in their head, they usually do everything in their power not to listen to the tune. The Kamloops Sunrays don’t have that choice. This week in Victoria, four Sunrays  Naomi Woolverton, 16, Carly Helgason, 17, Skye Griffith, 15, and Katie Hohensee, 16  are competing at the Canadian Open synchronized swimming championships, which run from Wednesday, May 2, to Sunday, May 6. They will be performing to music that has been filling the Canada Games Aquatic Centre’s air for a long time. “We’ve been practising with our music since last year after nationals,” said Helgason, who will swim at this year’s nationals in the junior duet category with Woolverton. Woolverton, a Sa-Hali secondary student, and Helgason, who attends NorKam secondary, chose music from the movie Once Upon a Time in Mexico‘s soundtrack. “We just wanted something fast and something out of the box a little bit,” said Woolverton, who will perform to Christina Aguilera’s Burlesque in solo competition. It is not uncommon for the girls to be at the pool practising six times a week during the season, which runs from September to June. The musical repetition does not stop when the goggles and bathing suits come off, either. “Sometimes, the coaches say you should go home and visualize it once, and make sure it’s on your iPod so you can think it over and make sure you know what you’re doing with it,” said Helgason, who has competed at two national championships. Helgason chose music from Blood Diamond‘s soundtrack for her solo routine. “It took me quite a bit longer to pick my solo music,” she said. Both upbeat and slower-paced music provides challenges for swimmers. “The faster music keeps you going and pumps you up but, at the same time, you get tired faster,” Helgason said. Griffith and Hohensee, competing for the first time at nationals, will do solo and duet routines in the 16- to 18-year-old division. There will be about 330 swimmers from across the country vying for podium finishes in Victoria. Most of them  thank heavens  will be moving on to different music after the last note sounds at nationals on Sunday. “Yeah, I’m pretty done with it,” Woolverton said. 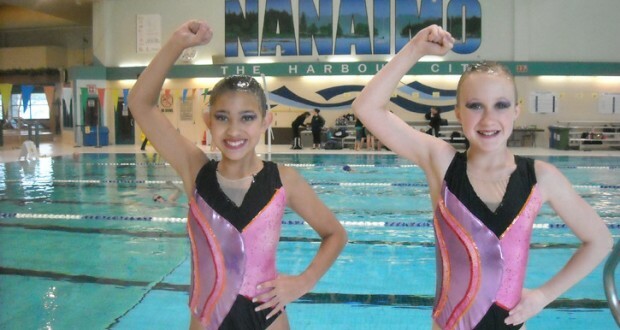 The Kamloops Sunrays were well-represented at the Jean Peters provincial synchronized swimming championships in Nanaimo on the weekend (May 13 to May 15). Finishing sixth in its first provincial championship was the Sunrays 12-and-under team, Jaden Ryder, Alexandra Knight, Charlotte Ribalkin, Dulcie Jakubec, Elisabeth Moore and Emily Johnstone. The 13- to 15-year-old novice team  Clarissa Nauss, Emily Crowe, Jaime Perry, Drew Eichorn, Cameron Blades and Katie Ignace  also placed sixth. Marlys Klossner and Nicole Kneale finished second in the 16- to 18-year-old solo division. Blades placed sixth in the 12-and-under solo category, while Ignace and Crowe finished fifth and Nauss and Perry were seventh in the 13- to 15-year-old novice duet category. “I was very impressed with all the girls and coaches, as I felt they all put in an outstanding effort to achieve the goals that we have all been working so hard towards over the course of our nine-month season,” head coach Morgan Smith said. Rosilyn Tegart isn’t spending the summer enjoying the sun and relaxing  she has bigger plans. The 20-year-old Kamloops native has spent the past two years training in Calgary with the Aquabelles in an attempt to make the jump to the Canadian synchronized swimming team. By August, Tegart will know if her water work will result in her making a splash on the squad. Tegart grew up in the Tournament Capital and was part of the Kamloops Synchronized Swim Club for 10 years. When she was seven years old, she had friends in the sport and wanted to give it shot  but she was a year too young to join. But her desire to try didn’t stop and, once she was old enough, she joined and hasn’t stopped swimming since. “I just love competing,” Tegart said. She’s hoping the months before national team trials will give her enough of a chance to work on her skills and fitness. After graduating from South Kamloops secondary, Tegart made the move to Calgary with duet partner Cassidy Beaver-Nicol to pursue more swimming opportunities. Last August, Beaver-Nicol made the national team program and moved to Montreal. This year, Tegart is hoping the pair will get the chance to reunite. She said she needed to make the move to Calgary to get more competition. “The club there was awesome. It’s a big club. It was just a step up from Kamloops,” Tegart said. Spending the season taking part in the duet with a new partner this past season was difficult for Tegart, who noted she and Beaver-Nicol had spent 10 years swimming together and seemed to know instinctively what the other was doing. And the results showed.In early May, Tegart had a strong showing at the Canadian Open in Quebec. Tegart and her duet partner, Emily Brooks, won the tier-seven senior free and technical-duet divisions, while Tegart was first in the tech-solo and second in the free-solo. The team was first in the technical-team division and third in the combo-team division. Tegart will spend the next couple of months preparing for national team trials. Once there, all swimmers will be given the same routines to perform and will be evaluated by the coaching staff and one judge. The end decision will be that of the coaches, but the judge will be marking swimmers on their technical skills. Last season, the national team took 24 swimmers and ran two teams. “It makes it more competitive because there is always someone there who wants your job,” Tegart said. The national team is based in Montreal at the Centre for Excellence, where swimmers range in age from 17 to 26. In Kamloops Sunrays swimmers Rosilyn Tegart and Cassidy Beaver-Nicol put on a gold-medal performance in duets at the Western Divisionals in Saskatoon last weekend. Tegart also placed fifth in solo junior, while Beaver-Nicol took third and Tenille Fisher sixth in solo senior technical. Beaver Nicol made the podium again in the solo free category, while Fisher placed sixth. All three qualify for the national championship, which will be held in Victoria at the beginning of May. Rosilyn Tegart is learning just how big the Canada Games Aquatic Centre pool is.After a successful year of doubles with partner Cassidy Beaver-Nicol last season, which saw the two win silver medals at the Western Canadian Championships, the Kamloops Sun Rays synchronized swimming team member is swimming as a soloist. The pair were forced to split up because Beaver-Nicol’s birthday falls in the first half of the year, pushing her up to the under-15 category. Tegart’s birthday is in the latter half of the year, keeping her in the under-14s. “It’s really different,” says the 13-year-old Tegart of the change. “This is only my second year doing solos. Cassidy is still there at practice but, at competition, everyone is focusing on you. The nerves wash away as soon as she is in the water, however. Tegart won two gold medals at the recent provincial championships in Surrey  one in solo routine and the other in figures  and qualified for the Western Canadian Championships, April 1-6, in Regina, Sask. Last season, Tegart was ninth in solos at Westerns and finished 14th at nationals. She also captured gold in the team event at the national championships. She and Beaver-Nicol will get another chance to compete together later this year when they travel to Selkirk, Sask. for the Western Canada Summer Games with Team BC. Having trained in synchronized swimming for six years, Tegart says her ultimate goal is to one day compete at the Olympic level. Members of the Kamloops Sunrays Synchronized Swimming Team made a real splash at the recent Western Canadian Championships, bringing home a gold medal in the open team category. The team, consisting of Cassidy Beaver-Nicol, Shaina Boe, Kaitlyn Dewhirst, Lauren Helton, Gayle Kabloona, Lyndsay McKiel and Rosilyn Tegart, tied for first with the Saskatoon Aqualanes in overall score, but since the Sunrays scored one one-hundredth higher in the technical portion, they won the gold. The Sunrays also showed good form in the individual and duet competition. In the 14-and-under national age group for figures, Beaver-Nicol placed sixth overall with a score of 68.67 while Tegart came in 10th out of 65 competitors, with a score of 67.30. The pair then teamed up to take silver in the duets competition, scoring 71.32. It was Beaver-Nicol and Tegart again in the solo final, finishing fifth and eighth respectively with scores of 70.66 and 69.32. In the 15- to 18-years-old national age group, Dewhirst placed 46th while Kabloona was 48th out of 75 competitors with scores of 69.07 and 68.99. The two then paired up for the duets competition, finishing 15th overall with a score of 34.08. 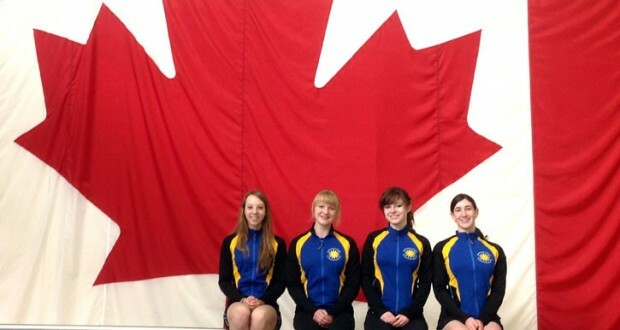 With the results, the team qualified for this year’s nationals, going April 27 to May 5 in Saint John, N.B. All Top 10 individual and duet finishes also qualify for nationals. Club president Ross Tegart says after such a strong showing at Westerns, the club will be taking a pool full of confidence with them back east.